Coastal Bend College TRiO Upward Bound G.O.S.T. 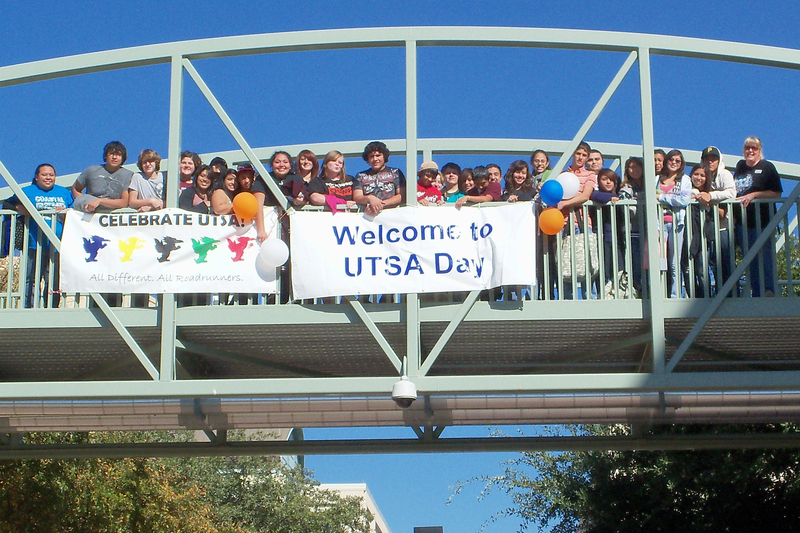 students recently took a campus tour of the University of Texas at San Antonio. Participants included, from left, CBC TRiO UB-GOST Academic Advisor April Zapata; Rey Mata of Taft High School; Joshua Rochester of George West High School; Evana Reyna of Sinton High School; Samantha Gonzales of Sinton High School; Madeline Pizana of Odem High School; Erica Castillo of George West High School; Troy Gonzales of George West High School; Demi Lea Garcia of Sinton High School; Brittani Culver of Sinton High School; Brittany Root of George West High School; Felis Romero of George West High School; Adrian Rodriguez of Odem High School; Jae Petru of George West High School; Tyler Edlin of Taft High School; Vikki Martinez of Sinton High School; Nikko Arellano of Taft High School; John Gonzalez of Taft High School; Celestina Encinia of Sinton High School; Mariah Pizana of Odem High School; Peyton Hicks of George West High School; Jonathon Casas of Taft High School; Marivell Garcia of Sinton High School; Miranda Rodriguez of Odem High School; Kassandra Perez of Odem High School; Samantha Saenz of Sinton High School; Aneesah Cordova of Odem High School; Bradley Salinas of Taft High School; and CBC UB-GOST Program Director Heather Anderson. The Coastal Bend College Upward Bound – George West, Odem, Sinton, Taft program recently traveled to The University of Texas at San Antonio with a group of area high school students. Participants sat in on UTSA information sessions regarding financial aid, admissions, campus life and specific majors and posed questions to university representatives. The students then took part in a real college experience by dining at UTSA’s Roadrunner Café. After lunch they browsed over 100 booths from various campus organizations and departments. Some students visited the Housing & Residence Life booth while others learned about student health services and campus recreation. Students were given brochures and gifts from the university, such as pens, notebooks, college memorabilia and information about the university. TRiO has been in existence at Coastal Bend College since the mid-1970s. Upward Bound G.O.S.T., with an annual award of $250,000, serves 50 high school students in four communities. Participating high schools are George West, Odem, Sinton and Taft. Participants receive instruction in literature, composition, mathematics and science on college campuses after school, on Saturdays and during summers. Currently 774 programs are in operation throughout the United States. “Fortunately, Coastal Bend College has TRiO programs that help students when it comes to choosing a college,” Zapata said. Students and staff will travel to the Texas State University campus in San Marcos in the spring. For more information on UB-GOST and other TRiO programs, go to: http://vct.coastalbend.edu/cbcss/content/index.cfm/fa/viewpage/category_id/3085.htm.